Peel the orange and gently slice of all the white part out of the peel. Using a very sharp knife, chop the outer portion of the peel into fine pieces. Keep aside. 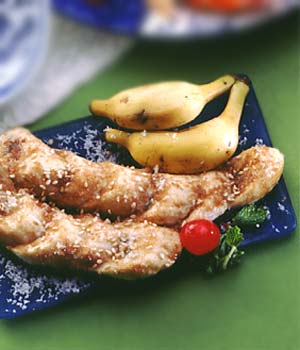 Peel and slice the bananas lengthwise and then halve them to get 4 pieces out of each. In a flat pan, heat the margarine and the butter. Add the ginger and orange zest and cook over low heat till they release their flavours. Add the bananas and powered sugar and simmer till the syrup is thick, keep turning the bananas so they are well coated with the syrup. Add the lemon juice.Add the brandy or the orange liqueur and simmer till the syrup thickness. Server garnished with sesame seeds and toasted coconut. This recipe tastes as good with apples or pears.